It’s been two weeks since my last post with no excuse other than I’ve been tired and busy. During this time I hadn’t even noticed that I had surpassed the 3,000km mark, which makes me even more determined to celebrate the next milestone more, so watch this space. My total distance Powered by Me is 3,028km and I’ve raised a total of £2,130 for five different causes. Thanks to all those who have supported along the way, it makes the world of difference when I am out there riding knowing that the money raised is helping others in need. Interested in donating? Visit my donate page here. On 26 May I set off on my ride from my home in South East London to Robertsbridge in East Sussex to go to a best friend’s wedding. An expected heat wave hit South East England with temperatures reaching just under 30 degrees Celsius. Usually I would bask in temperatures like this, but by lying down in a park with a picnic and a cold beer! Until this ride I hadn’t cycled long distances in hot temperatures before. I’d run and played other sports in the heat but not this. It wasn’t long before I just felt like I was climbing and climbing and climbing. It felt never ending in parts and something that I’m just not used to as most of my rides are within London. The hills paired with the heat meant that I tired out within just a few hours. I did what I could to make sure I stayed in the shade, stopped to stretch every hour and kept myself hydrated. The route took me through Bromley, Halstead and Sevenoaks where I stopped for a long lunch at a cute little sports themed cafe called 1809 in Hildenborough. I ordered most of what I laid my eyes on, I was so hungry and thirsty I had the lot! Would highly recommend as a pit stop for any cyclists passing through, friendly and welcoming with some great food and drink. Leaving lunch I had several more hours of cycling, getting through more hills as best I could and coping with the heat. I passed through Matfield, Goudhurst and Hurst Green. With less than an hours riding to go, I was close to heat exhaustion so decided to stop for a brief pit stop at the Ringden Farm Shop and guzzled down an ice cold homemade lemonade and fudge – it was just bliss and gave me the sugar hit I needed! The farm shop owner asked where I had cycled from and was shocked that my answer was, ‘London,’ and thankfully told me it was downhill for most of the way to Robertsbridge. It wasn’t long before I saw that sign and arrived at my destination for the weekend with beautiful quintessential countryside views over looking the South Downs at The Dairy, Willow Cottage. I finally made it and it was now time to recuperate, relax and prepare for the wedding the next day. The wedding day came and was only 6km away from The Dairy. BUT. I had to somehow get to the church sweat free and looking presentable, but I also needed to wear some sort of sports wear and my helmet! It was all good practice as this year I have endless hen dos and weddings that I needed to travel to and from Powered by Me. I set off nice and early so that I could cycle as slowly as possible to the venue to make sure I didn’t sweat off my make up and be sitting in the church smelling. Fortunately it was a bit cooler and I passed my heavy items (locks, jacket, lights) to a friend who was driving to the church. Shortly after I arrived at the church relatively sweat free and after a quick shoe change, I was ready to go! 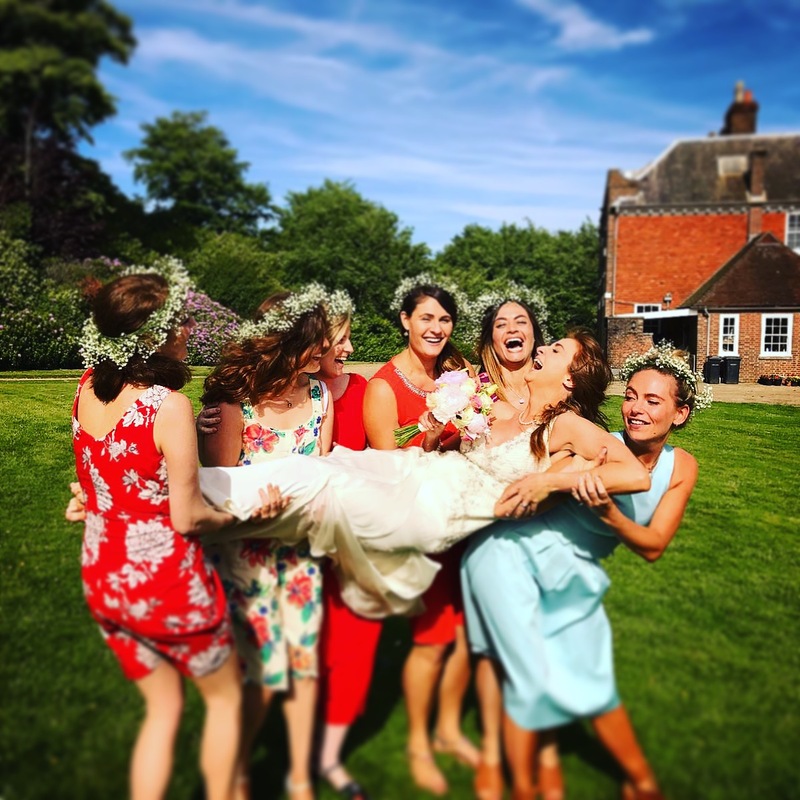 The wedding was just fantastic, a cute little church ceremony followed by a festival themed wedding in the beautiful setting of Brightling Park with tepees, outdoor fires, afternoon tea and a hog roast – what’s not to like! It wasn’t long before the booze was flowing and even though I had to cycle home that night I made sure it didn’t stop me having a good time. It wasn’t long before several bottles of prosecco had been drunk and countless shots of tequila and I began to make my way home, cycling the same route as I had done that morning. Within minutes I was in trouble. I didn’t expect it to be so dark, literally pitch black and my lights not even helping my visibility. At one point I was picking up speed but I couldn’t see I was going down hill. I made a silly mistake of not packing a head torch and all I had was my phone torch and Google maps for directions. In the end I walked most of the way getting lost several times and after setting off at 12.30am I arrived back at The Dairy at 2.00am! Never again will I not pack my head torch. Lesson learnt and it’s all learning for the future weddings I have coming up, some of which I may be staying further away from venues than this one…watch this space and if you have any tips, advice or just want to tell me how stupid I am please get in touch. The next day I was a little broken but knew that a days riding had to sort out my hangover. Cycling the same route home I passed familiar villages and towns and fortunately for my mind and legs, it was more downhill than up! The weather was much cooler but yellow rain warnings were forecast for later on in the day, which basically meant torrential down pours and flash flooding. With an hour to go the heavens opened and I took shelter in a bus stop near Lewisham as the visibility was so poor with the rain and I also had to put on what little wet weather gear I had. After pulling myself together and braving the rain, I arrived home just after 5pm to some familiar sights and knowing I had food, drink and rest ahead of me. My first wedding weekend complete Powered by Me! In total, I’d clocked up another 200 odd km Powered by Me and raised another £100 for May’s charity The Dystonia Society. Despite some tough hill climbing, one traumatising night ride and some intense heat and torrential rain, after a few days recovery I am feeling stronger, more confident and generally chuffed!